For the 40th time in the past decade, a Russian cargo freighter has arrived at the International Space Station carrying vital supplies to feed the needs of the orbiting laboratory and its resident crews. But this docking required the intervention by one of the most experienced cosmonauts. 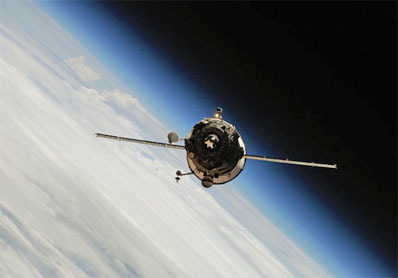 The Progress M-08M spacecraft, flying on autopilot, performed a flawless rendezvous with the space station after a three-day journey from the Baikonur Cosmodrome launch pad, but some yet-unspecified problem at the last minute prompted cosmonaut Alexander Kaleri to take over manual control and guide the vehicle to docking. The successful linkup to the Pirs docking compartment came at 12:36 p.m. EDT (1636 GMT) while soaring 220 miles over western Kazakhstan. Hooks and latches were engaged a few minutes later to firmly secure the 24-foot-long craft to the station. The Expedition 25 crew of commander Doug Wheelock, fellow NASA astronauts Shannon Walker and Scott Kelly, and Russian cosmonauts Fyodor Yurchikhin, Oleg Skripochka and Kaleri plan to open hatches and enter the Progress later today. The cargo includes 2,804 pounds of equipment, food, clothing and life support system gear, 1,918 pounds of propellant to replenish reservoirs that feed the Russian maneuvering thrusters, 498 pounds of water and some 110 pounds of oxygen and air for the station's atmosphere. The Progress was launched Wednesday atop a Soyuz rocket from Baikonur Cosmodrome, reaching a preliminary orbit of 151 by 120 miles. A series of precise engine firings propelled the freighter on the orbital chase. After arriving in range of the space station today, the vessel began a flyaround maneuver to get lined up with the docking port and then executed a roll maneuver to properly orient its solar wings with surrounding structures around the Pirs module. A brief stationkeeping hold with about 650 feet between the freighter and station allowed Russian flight controllers to assess systems before giving approval to commence the final approach. It was during stationkeeping that Russian flight controllers in Moscow instructed Kaleri to activate the TORU manual docking equipment and take over the piloting tasks from the Progress' autonomous KURS system. Kaleri, a seasoned veteran on his fifth spaceflight, worked inside the station's Zvezda service module to fly the freighter remotely using television views and a pair of joysticks. "Half a meter," a one of the cosmonauts reported as the Progress closed in. "Contact. Capture confirmed." "Alexander Kaleri manually bringing in the Progress 40 for a smooth docking," NASA TV commentator Rob Navias announced from Houston. "Congratulations to Mission Control with the next milestone completion," Kaleri radioed Moscow. "And congratulations to you with a successful docking. The range rate at the time of contact, based on our calculations, was 0.067, so you get an A today," a Russian flight controller said. "This was just like one our training sessions," Kaleri replied. The craft joins an earlier resupply ship that arrived in September and remains affixed to the outpost, plus two Soyuz crew transport capsules currently residing at the space station. In addition to being the 40th Progress to dock with the station, this resupply vessel was the fifth of five scheduled for flight this year. The ship will remain attached through mid-January, leaving shortly before the next freighter is launched.